How to change texts on the site? and how to translate? Go to Panel, choose Settings and press Translations from the left sidebar. Find the locale you are currently using on the list of available language files (the one with grey badge Active) and hit EDIT. Find the phrase that you want to change - probably it will be easiest by using the search tool in your browser (Ctrl + F). Type new text in the right column next to the phrase you want to replace. Hit Save (blue button on the right of the field you just updated) to see the changes immediately or continue editing other fields and click Save (all) at the top or at the bottom of the page when finished. Changes done! 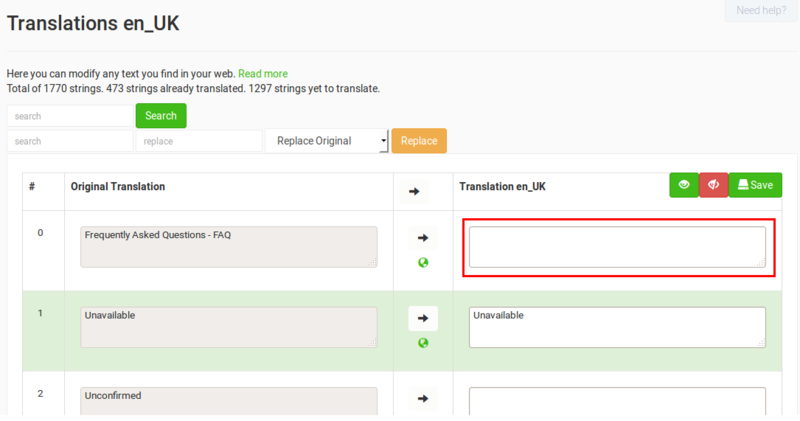 If you would like to translate Yclas to another language, please feel free to contact us and we would definitely like you to send us any updated/new version of a translation. Translated strings will be added in your /languages/xx_XX/LC_MESSAGES/messages.po. On update, this file will be replaced by the new messages.po file and changes may get lost. To avoid that, backup your messages.po file and after the update to replace the new one with that. Be sure your hosting has the locales (you can check it in unix with the command locale -a); if not, the site will not use the language you chose. You need the .mo file, this is the one that really matters to the system. You might need to change the HTML charset or the collation for your DB depending on your locale. Check the permissions for the files .po .mo the should have 755.